Karen Power has been providing excellent administrative support and customer service at UFV since 1990, and is the winner of the 2018 Staff Excellence Award. Balancing a passion for customer service and a positive results-driven nature with the ability to overcome challenges, Karen Power embodies employee excellence. For her years of dedication to and excellence in her work, Karen is this year’s winner of the Staff Excellence Award. Karen first became an Assistant to the Dean in 2004 and brought those talents to the Faculty of Professional Studies in 2012 where she has excelled ever since. Dean of Professional Studies Tracy Ryder Glass notes that Karen’s organization skills are impeccable. She ensures timelines, processes and meetings are planned for, always with an eye to deadlines. 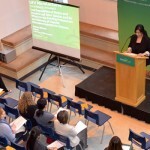 Through her leadership, the Department and School staff (she mentors 13 staff) are fully connected and provide a voice in relation to important Faculty of Professional Studies plans and decisions. Aside from her unparalleled ability to plan and organize, if you ask anyone what they admire most about Karen, they will say it is her positive approach to all that she says and does. Her smile is genuine and infectious. “UFV is a place where service is not just a word. It is an action that flows continuously, creating a community – it’s contagious,” says Karen. You certainly deserve the award and the article sure nails down exactly the Karen I use to know. 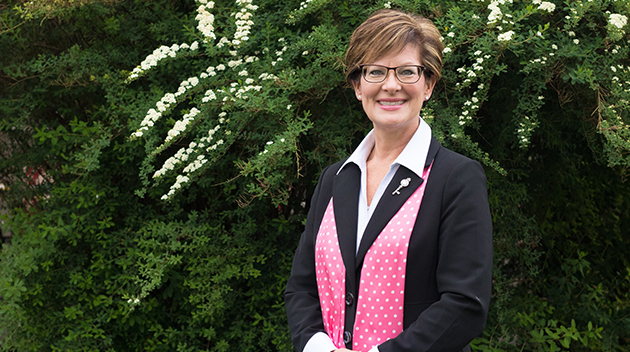 A truly appropriate recognition for a wonderful member of the UFV community – and person. Congrats Karen!